BitCoin seems all the rage these days. Like any good bubble, greed will overtake logic for awhile, but eventually we all have to sit down at the table of reality. So without further ado here are 26 reasons that BitCoin is a BitCON. 1. First and foremost it has no intrinsic value. The first 6 million were produced with little or no energy. Those that had them, set out to build the perceived value, only to sell to the greater fool for their real value. That is a pump and dump, Ponzi scheme plain and simple. 3. Then it is awful even as currency, because of the massive fluctuations in its price. One guy was so desperate to get Bitcoin to catch on, spent 10,000 Bitcoin on a Pizza. So an early adopter spent 10,000 on a $10 pizza that cost the pizza owner $1 to make. It is insane to think that now 1 Bitcoin this was worth as much as an ounce of gold. 4. Look at the energy input of bitcoin versus silver or gold. No one can deny that it took very little energy to produce the first 6 million Bitcoin and the only reason why it takes more now is because it was programmed that way. I challenge any Bitcoin person to look at all of the time, energy and talent to find, mine, refine and coin a single ounce of silver and tell me that somehow Bitcoin is worth multiple of that in energy? 5. It is also not anonymous. I have heard from the Bitcoin programmers themselves that there are ways to find out who is using them and how much they have. You know that customers that buy anything online usually need to have something shipped to them, do you think it takes a genius to connect those purchases to maybe illicit Bitcoin purchases? 6. There there is the whole transparency aspect of it. I have already stated that Bitcoin is not anonymous, especially when they buy something with it, but they transparency of the log would be a way for the government to eventually role out a currency that could be tracked, traced and tax all along the way. Your history is forever on the net. Knowing that nothing disappears on the net and that we are entering an age of super processing power, I wonder if those that seem to dance in the dark doing illicit things realize that it is inconceivable that their actions will stay secret for long. I am sure in the near future it will be almost sport to identify those that want to stay secret. 7. It attracts con artists. Because of it’s supposed anonymity and non recourse nature it is attracting the worst in humanity with outright fraud, drugs and now even murder for hire. 8. Then there is the fact, that since this is all open source, the barrier of entry of hundreds of new crytpo currencies being created lowers the perceived value of Bitcoin and it turns out to suffer what all new products have, the commoditization of the idea. Knock offs will abound, more scams will spring forward and more people will get hurt and that will drive people away from the whole idea. That is until some government backs a crypto currency in a post dollar world and forces people to accept something for nothing money again. 9. Then there is the fact that this is only useful when the banking system and the dollar exist. Bitcoin needs to use banks, business and exchanges that then need to comply to government and FINRA regulations and demands. Do you really believe that when the larger dollar ponzi scheme collapses that people are going to trust Bitcoin? I believe people will not want anything but the real tangible goods in their hands. Silver will thrive in that environment. I cannot imagine going to a farmer now much less after a collapse and trying to Bitcoin for a gallon of milk. Or how about a gallon of gas? But I am sure I could take a silver quarter and do that now, anywhere in the world, in the past, present and future. Exchange real value for real value is natural, but exchanging perceived value for real value is not for me. 10. Then there is the whole notion of Bitcoin being a cheap way of moving money. Have you ever looked at Dwolla? I think it is much better without the currency risk and is over all cheaper because the conversion from Bitcoin to Dollars is not cheap. 11. Bitcoin is not really decentralized because there are so many choke points in the exchanges and redemption of Bitcoin. People in China are learning just how quickly a properly motivated government can quash the perceived value of Bitcoin. 12. Decentralized is not enough, it must have real value. 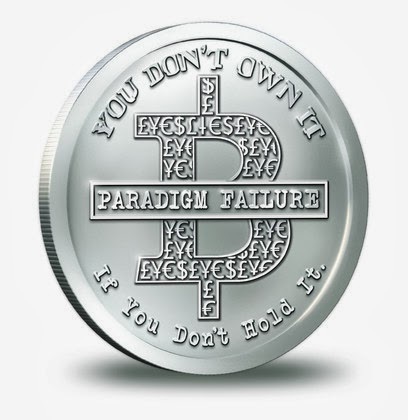 You want a decentralized currency, silver is awesome for that. It is private and can be stored for hundreds of years if necessary. It is accepted world wide and throughout history. Bitcoin cannot even begin to touch that record. 13. Then there is the fact that the CIA was in on this early, met with the programmers and the very next week Mt.Gox crashed to $0. Do we really believe that these government agencies fear Bitcoin? I believe they are simply war gaming what a post dollar world would look like. 14. That leads to the mining aspect of it. Because of it’s nature it is very difficult to mine bitcoin and only those with high powered computers can do it and I can think of no other guys than Washington and Wall St loving that with more powerful computers and using other people’s money to mine them. 15. The there is the Bill Gates thing that has bothered me for awhile. He talks about “digital mining techniques” hurting the demand for gold. At the time I covered it, it did not make sense but watching the rise of Bitcoin and the fall of gold and silver, digital mining techniques he is talking about makes sense in a globalist scheme. 16. Then there is the China factor. China does not want dollars anymore, do we really think that they would want Bitcoin or anything like it. Why wouldn’t they just create their own? They are going for real wealth that drives the real world powers. Why would we do anything different given the demise of the dollar? The Chinese are emptying the gold vaults and just closed Bitcoin to their citizens. 17. Then there is the tax implications. You may have not noticed, but there are trial balloons circulating that they are going to go after Bitcoin people for unpaid taxes on their profits. Remember, that is how they got Al Capone? 18. Then there is the amount of energy is needed to maintain Bitcoin. The amount of electricity to maintain the system must be growing and we are heading into an age of higher energy costs and supply disruptions. The wonderful thing about silver is that all of this cheap current energy is being saved in the inert, refined silver that needs no further energy inputs. 19. Then there is the counter-party risk of Bitcoin. There are so many points of risk and as people that are in the business of Bitcoin can see that one letter from an government agency and they would stop the dealing in it. I have already heard a could people dabbling in Bitcoin lost everything with no recourse because of suspected transactions. 20. Then there is that anti government aspect of it. Really? It seems the Anglo American bankers love it, including Ben Bernanke and JP Morgan. It is right up their alley with another something for nothing scheme. They may crack down on Bitcoin only to launch their own brand. Look at the Lotto. They went after the mob for running numbers, but then made it legal for them to profit off of. They went after Charles Ponzi and then created their own Ponzi Scheme with Social Security. I am telling you Bitcoin or something just like Bitcoin will be used to sell to the people after the dollar collapse, a new electronic worthless currency. Who knows maybe we will get bonus points for watching TV and using it? They already have millions hooked on EBT cards, get the corporations involved and the government muscle and you could see the final realization of a digital currency where they can cut you off if you get out of line. How many stories do we already hear about bank bailins and IRS and NSA messing with people’s bank accounts. Having real wealth outside of the system is the only antidote for that. 21. Then there is the greater fool. The guy that bought Bitcoin at $7 has a great incentive to promote the crap out of Bitcoin and as more people take a shot with it it drives up the perception while maintaining a constant supply. Of course the price will go up. But what happens to the guy that bought at $1200 for 1 BitCoin? Does he really think he is going to find more people to bid $2000? 22. Which brings us to the BitCoin calling LiteCoin a Ponzi Scheme. It was on the official BitCoin wikipedia and has since been removed but I have a copy of it for you. 23. Enough of the lesser of two evils dialectics. The Criminal Elite thrive in this by offering distractions from the opposite consciousness solutions that are at our feet. All Bitcoiners say Bitcoin is better than the Dollar, but seem to shake and stumble on how Bitcoin is better than silver. And given the current run up I cannot see how anyone would not dump their Bitcoins for silver given the relative price between the two. 24. Even the most adamant Bitcoiners would never put all of their wealth in Bitcoin. When push comes to shove they will admit that it is not something they would go all in on. I know more than a few that have admitted to me that they are selling for silver meanwhile they are promoting BitCoin. Watch what people do and not what they say. The gambling mentality is attracted to stocks, options and Bitcoin. Real people don’t mess with that and would rather in vest in real friends, real ideas and real wealth. 25. The destructibility of Bitcoin versus silver. How many stories of stolen Bitcoin and trashed hard drives have we already heard? Because it is just code, it will take very little to have it erased or corrupted. I could throw an ounce of silver in a septic tank for and once it is washed off retain it’s value. 26. Finally it is a digital distraction from the real wealth that will be most needed when times get tough. Just like I am sure the Silver and Gold ETFs were used to distract real dollars from physical gold and silver, I believe this lotto fever for Bitcoin has distracted a good many freedom minded people away from silver and gold. The good news is that as people sour on this fad, they will look to take their Bitcoins and cash them in. I have had more than a few confess to me that they are doing just that. And do we really believe all of these pundits that have been hyping Bitcoin aren’t doing just that? I mean come on they made a living from pushing gold and silver, but the the real money is made in hyping Bitcoin rather than the small margins on selling real metal. There will come a time when even the most die hard promoter of BitCoin will see the diminishing returns in pushing Bitcoin, and will move on. I am sure a good many of perceptive eyes will see through this and these men have sold their reputation for a quick buck. 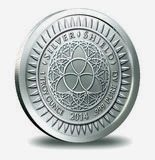 The 2014 Silver Shield BitCon is the first low premium Bullion Strike of the series. The BitCON artistically shows the lies of the intangible, debt based, generational ponzi paradigm we operate in and the real solution of having real wealth in your hand when the music stops. Earn faucet bitcoins at Easy Bitcoin Faucet. 11 to 33 satoshis per 10 minutes.